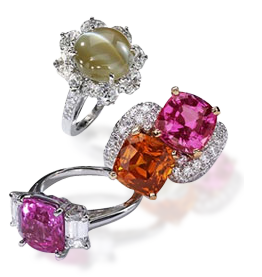 Like flowers, colored gemstones come in every color and hue, tone and saturation. Both are born of Nature and evolve into something exquisite. 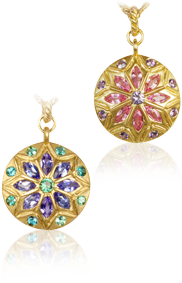 But, unlike flowers whose beauty fades with time, the beauty of colored gemstones is everlasting. Gathered from all corners of the world, gemstones have fascinated mankind for thousands of years. Every colored gemstone is a unique creation that brings with it a rich history that blends the mystery of Nature with the skill of man. The personality of gemstones are as alluring and different as the people that wear them. It is interesting to know that many gemstones such as sapphires, garnets and tourmalines to name just a few, can occur in many different hues or colors. 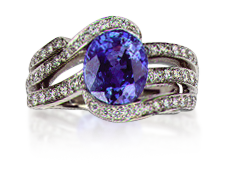 Sapphires, for example, not only come in tonal shades of blue, but also yellow, pink, orange and even colorless. If a sapphire is a medium red to dark red it is classified as a Ruby. The beauty of colored gemstones is that whatever your favorite color there is a variety of gemstones to be found to please you. Some gemstones grow in large crystal sizes and because of that and their frequency of occurrence, are rather inexpensive yet undeniably beautiful. Examples being citrine, amethyst and other varieties of quartz such as smoky and rose quartz and onyx. On the other hand, many gemstones are very rare, growing in small crystal sizes, in few locales and difficult to find in gem qualities. Examples being sapphires, rubies and emeralds, along with alexandrite, tsavorite (green garnets), spinels, zircons and tanzanite. There is a long list of lesser-known gemstones that are available, affordable and desirable that you should consider when making a purchase. Kenneth Gordon is a Graduate Gemologist and would enjoy discussing the various gemstone options with you. Well-selected colored gemstone jewelry can look as fashionable and beautiful years from now as it did when it was first purchased. This timeless quality allows you to use gemstone jewelry as a personal statement to enhance your wardrobe season after season. Your colored gemstone jewelry will become your unique signature. Gemstones though aren't just about color. Ancient peoples attributed magical, mystical powers to each stone, and believed that many of them could cure specific ailments. Even today these attributes and superstitions are aligned with the healing powers of various gemstones. In addition, ancient astrology and beliefs going back to biblical times have provided the tradition of wearing our birthstone. Colored gemstones are all beautiful in their own way; there is a wide variety of colors, unique shapes and sizes to make something special your own. 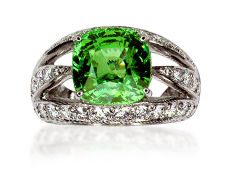 Allow us to help find the perfect gemstone for your taste and lifestyle.